Started in 1987 by Lorenzo Cavasanti, Sergio Ciomei, Caroline Boersma and Giulio Capocaccia, Tripla Concordia is one of the more representative ensembles in the panorama of ancient music. The name of the group Tripla Concordia is taken from the title of a collection of English music by Matthew Locke and his contemporaries, published in London in 1677. The group’s repertoire is centred on the music of the 17th and 18th centuries and the group itself comprises forces ranging from a recorder – and flute – cello and harpsichord trio to a small orchestra. In this form the group made its debut in the GOG 2001 concert season in Genoa with audience and critical success. 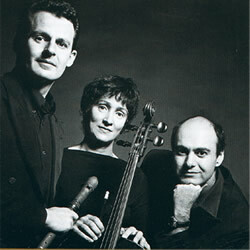 Tripla Concordia has appeared on radio and television in several countries of the European Union and has performed at major music festivals both in Italy and abroad, such as Musica e Poesia a San Maurizio in Milano, the Festival Internazionale di Musica Antica di Urbino, the Schlosskonzerte in Salzburg, the Festival Internacional de Musica Antigua de Daroca in Spain and the Music Weeks at the Cité de la Musique in Paris. The members of the group have also played at such major classical music venues as the Philarmonie in Berlin, the Auditorium Nacional in Madrid, the Théâtre des Champs Elysée in Paris, the Gran Teatre del Liceu in Barcelona, the Concertgebouw in Amsterdam, the Teatro Universidad in Santiago, Chile, and the Royal Albert Hall in London. The recent concert engagements in Italy of Tripla Concordia include appearances at events organized by the Amici della Musica of Florence, the Accademia Filarmonica Romana, the Società del Quartetto of Milan, the Amici della Musica of Padua and by the Accademia Filarmonica of Verona. Tripla Concordia has made a number of recordings, which have earned it international recognition. In 1992, the French classical music magazine Diapason voted its CD Canzoni, Fantasie e Sonate (Nuova Era 7041) among the best recordings of 1991, including it in their “Ideal CD collection”. The group’s recording of the Sonate per flauto by Mancini (Nuova Era 7138) was awarded the A.Vivaldi Prize by the Fondazione Cini of Venice. 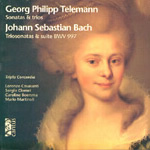 In the spring of 1998, their CD of compositions by Telemann and Bach for the Spanish label Cantus won several prizes in France, Germany and Korea. 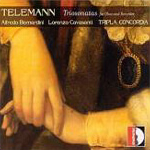 The three Telemann recordings were recieved enthusiastically by the trade press. Continuing this long-term project on the works of G.Ph. 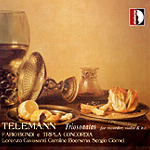 Telemann, the group’s latest two CDs, with Alfredo Bernardini and Fabio Biondi joining respectively in the oboe and violin Triosonatas, have been greeted with enthusiastic reviews in the specialist press throughout the world.